The crowd roared cheering on the final contestants of the gladiatorial combat. Well final contestant really. The winner of the past 5 events had been a mysterious rider of a dragon. The other contestant this time around was more competent than usual however. 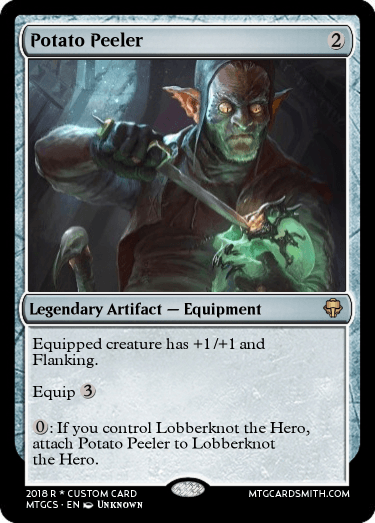 It was a small rat person who wielded double swords. He charged at the dragon and its rider, but they evaded just in time. The dragon flew at the crowd. Who was to be the unlucky individual today. It ended up being a priest who came to protest the gladiators. The priest was flung up into the air by the dragon's jaws and landed of the rat person. In a last desperate attempt to win, the rat charged at the dragon, the rider was injured, but the rat was killed. 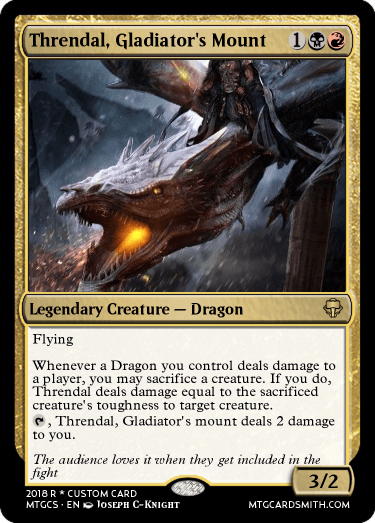 These pit fights were far too easy for the dragon, but the rider desired to keep on winning and winning, not risking anything, winning everything. Nya looked confident. Long ears for a human, she thought. She looked Druidic, the complete opposite of Tai. Nya held a furnished leaf staff and she wore white robes and a crown of flowers. It was a three way rivalry now. Nya swung her staff elegantly with surprising grace and speed knocking Tai off her feet. Tai threw her green powder creating a bear that was huge, it towered over Nya. Nya directed some ancient magic and the bear turned against Tai. It swung its claws wildly and chased her threw the air. Then, Nya summoned eagles. “No way,” Tai screamed as she flung her sleep powder in the air. All the eagles instantly fell asleep. Nya jumped into the air, whirling her staff above her head, struck Tai in the head. Nya readied herself. Sylva was just as graceful, as fast, and as elegant. Nya’s staff had a resounding crunch with Sylva’s hammer. Sylva took out all the animals attacking her with her dagger and slammed Nya hard. Tai stepped back on to the field. Sylva used her hammer tactic. Throwing her hammer, but this time, Tai just stood there. The hammer pinned her to the sand and when it did, she spilled her black powder on the sand and cast a lunar spell. Sylva was racing toward her, eager to finish the match, then there was a dark explosion. Tai had won. Here is my entry. 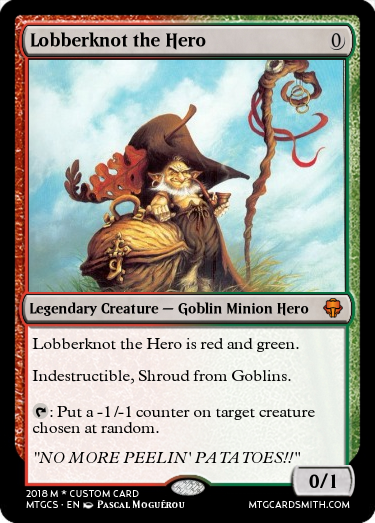 Lobberknot! He's our party's goblin henchman. After Nyas wonderful afternoon of training she returned to the tavern, it was dark, and off in the distance she heard the sound of people chanting. When she drew closer she saw. The missing guard and some other people. She readied her magics, she sent vines which creeped through the forest and began to encircle the guards. Their eyes where a deep purple and their faces grey and decayed. She had to stop them, and quietly. The vines drew nearer and nearer and then she thrust all of her might and encircled all but the guard. Their trance was broken and they realized what was happening. But it was too late. The vines covered them completely then exploded in a brilliant bright light. It was done. Whatever they were doing they will do no more of. The wurm and its handler had been spending most of their time in isolation, practicing outside the border of the town during the day. The handler's shouts could often be heard, and locals were quickly warned to watch their step when they venture out of the town. The occasional roar could be heard as well when the wurm went hunting, usually when it found prey. Other than that, they remained cooped up in town, sleeping. Jaholion quietly contemplated Sylva and Tai training. He thought to himself: "What a shame it would be if those 2 went up against each other. Could definitely cause some heartbreak. I can't imagine how much grief I would experience if a had to fight Ami"
In the next afternoon, many of the contenders were currently busy in their own activities. Some were training themselves at the city's outskirts, some were still asleep in the tavern, and some just did whatever their own things were. In the meanwhile, a certain cloaked female lich frowned. 'Someone or something had interrupted the ritual earlier.' Pondered the walking undead. She was currently in a sort of hidden path of a forest, and she saw a person was approaching her. 'Still, not everything was lost.' A thin sinister smile was plastered on her slightly decayed face. The other person then approached her, and he promptly knelt in front of the lich lady. The person wore dark clothing along with a crow-like mask. "Speak, my faithful follower." She commanded. "My Lord, there was a sort of complication. I couldn't quite identify the perpetrator, but I believe it was a druid due to the usage of nature magic." Responded the kneeling person in a raspy voice. "I see. Now hold on for a moment." The female lich stretched her hand and purplish magical energy slowy out from it. It then coalesced around the kneeling person. "That should protect you from the cold grasp of death, my faithful follower. (Or it would just turn him into a wraith.) From tonight on, gather some more people again and erect the ritual again in more farther area. I suggest seek for an abandoned building this time. Now go and spread the words." "It shall be done, my Lord." The cultist stood up and saluted. Then he slowly walked away towards the deeper part of the forest. 'A druid you said...' Contemplated the undead lord with a slight anger in her expression. A wild squirrel then got withered away while it was searching for food. Its life's energy was sucked away by the currently walking and frowning the once deified high priest of the Ebon Hand. Pele had been in the Alley since she had woken up to 2 more ravens watching over her. She decided to look over the files of the 17th Tournament to see what had happened last time. "You're right" Pele replied "Which means it will be harder to get in" She then tried to spark a flame in her hand but it lit a nearby tankard on fire. "Sorry... It's just I don't think I can do it" She said in a defeated voice. "You will do your best and that is about all you can do. After a few hours of training in the alley she noticed a flickering darkness behind her. When she turned around she saw a shadow 3 times the size of her taking up the whole alleyway in that direction. Before she could react she saw the 3 ravens flying away without her. "Wait!" She shouted after the ravens as she started to run from this alley across the street to the next group of alleys that she could run through. Before she got out of the alley she stopped. She realized that it was only a living shadow and she could create fire and that fire generates light! 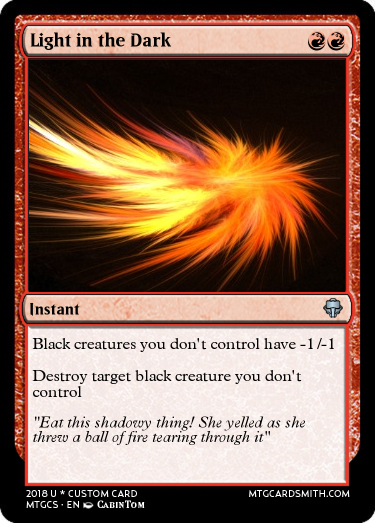 "Eat this shadowy thing!" She yelled as she threw a ball of fire tearing through it while lighting up the alleyway as it went through it. The shade was pushed through the alley by the fireball. In the distance she could see the ravens flying back each carrying a glowing bottle in their beaks, she couldn't make out what they were until they got a little closer and realized that they were glass containers of bottled fire! As the ravens dropped the glass containers that each shattered creating a fiery explosion. The explosion tore through the shade but also left marks in the walls and knocking her backwards. The intensity of the heat isn't what knocked her out, it was the blast backwards causing her to have the breath knocked out of her and hitting her head on the ground. Tai heard the magical explosion of vines. She raced in the forest only to see Nya. Bodies of many humans were scattered in the midst of the forest. Tai searched them as the dim light shone through the parted leaves. They reached the field. Sylva was waiting for them. Nya swept her staff in a circle as Tai quickly dodged. Tai had a secret weapon. It was her rose, it was dangerous indeed, but only Tai knew about it. Nya didn’t want to risk it, so she stayed silent and jabbed again. Tai parried with her rose. She stuffed some powder in it and used it to jet it at Nya, Tai won. As he was walking through the city he saw the most peculiar sight ravens flying through the city with bottles of...fire?! Koorir sprinted after them as they were picking up speed and diving low to the ground. He heard rather large booms down and alley...as a lick of flames darted out then retreated. He remembered there was a girl with a Raven...what was her name again, that is right Pele! He turned the corner and saw the scene Pele was on the ground unconscious there were several Ravens around her, tending to her. But there was also a shade although not as badly injured it was still injured...it tried to make its way to finish Pele but Koorir saw it first. Koorir chucked his long axe at the shade, it noticed the axe and dodged it. Koorir sped up. He pulled out his hatchets and started to run towards the wall. Now he was running on the wall just barely he threw his hatchets one up into the sky and the other at the wall to richochet to the shade. The shade dodged the first hatchet. As Koorir started to throw punches at the shade. It easily dodged them...it had been a while since he had a good fight (for Koorir). The second hatchet came down as the shade had him, currently, pinned to the ground. It missed Koorir grabbed it from the ground and swiftly fended off the shade. Nya had been practicing a little something in her alone time. Slowly vines creeped up over her body and encased her, then a bright light appeared from within the vines and they began to move she charged at Tai. She parried with her strange rose, but she wasn't fast enough to dodge the second one, Nya won. Afterwards the vines quickly disappeared and Nya fell to her knees panting. "It takes a lot out of me to do that, but it seems to be effective." She said with a smile. The 3 of them just stood there until sylva faced Tai and pulled out her hammer. Has the tournament started yet, and, if not, can we still put up champions? Yes you can still enter. “Nice vine trick Nya, where did you learn that one?” Tai asked. They had a lot in common. They locked eyes and both knew the answer. They ran out to the training field and started training. Oddly enough, Sylva wasn’t there. ( @KingWatherton - As you can see from the title, the tournament is still open for more contenders. So yes, you can still present your champions! @pjbear2005 - The previous tournament was the 16th tournament. The tournament which everyone's champions have registered to so far is the 17th tournament. @shadow123 - The cultists who were killed in the forest were not soldiers but weak-willed, homeless people. Some of you have begun training with others and even made some interesting little adventures. But remember you're not alone in this world. There are eyes watching. Some of your actions may have consequences. He is here at the Tournament of Champions because his teacher thought it was best to get some 'practical' experience, by competing in, and hopefully winning, the tournament. 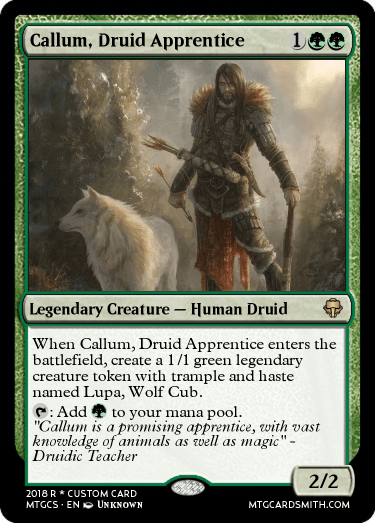 Callum walks confidently into the tournament audition hall, with Lupa, his wolves familiar stalking next to him. He stops in the centre and speaks loudly "I'm came for the tournamant, where and how do I sign up?" Tavern regulars and some contenders turned their heads and looked at the stranger, who stepped inside the hall. Then an old bearded man, who was sitting right next to the druid, pointed at the registration table at the back of the tavern's hall. "Right there, young lad. You pick up the quill and write ye name in the list!" 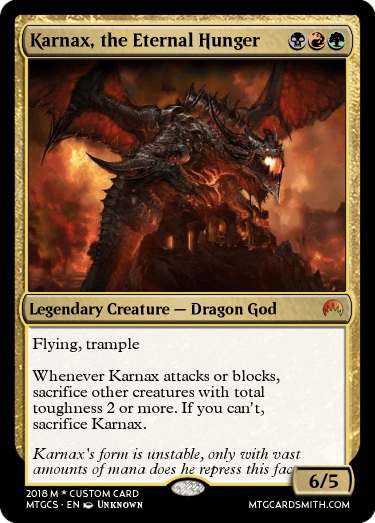 Here's the new and improved Karnax. Updated with help from @TenebrisNemo. And here's his signature spell. An elf dressed in fine gold laced robes with horn on her waist walks in the door to the tavern. She's accompanied by two paladins in full plate with long swords and shields. She blows into her horn to get the attention of the bar goers. 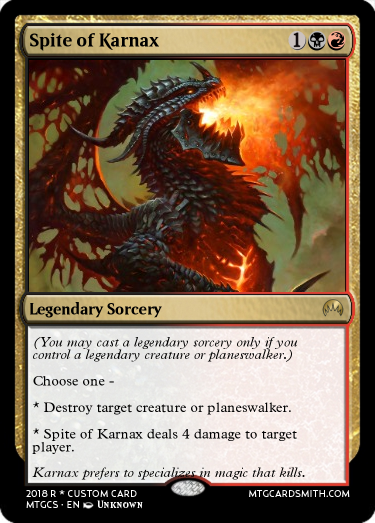 "Here be the eternal hunger, the render of worlds, the bringer of destruction, the harbinger of death, bearer of the legion, Lord Karnax, the devourer." "Who is this Karnax you speak of?" one of the bar goers inquires. The elf gestures to the window. Standing just outside is a gargantuan black dragon with glowing orange eyes. The elf walks up to the sign up paper and pulls a piece of charcoal out of her pouch and with a red glow the name Karnax is etched to the bottom of the parchment. 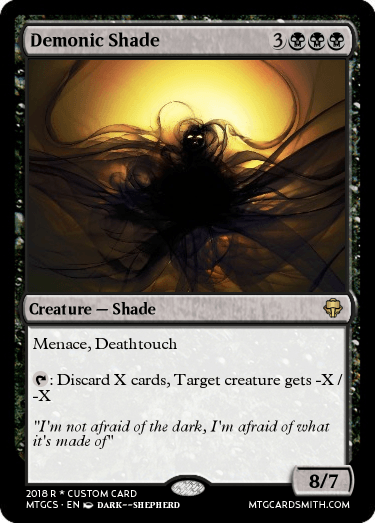 I've made many cards on MTG Cardsmith before but got an account recently. I'm going to enter a champion but am having trouble finding art. 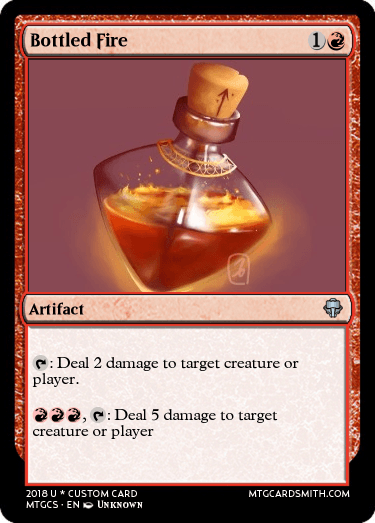 Where do you guys find art for your cards? Over twenty contenders from different worlds have found their way to a town named as Eternstor. Next to it is the Great Blue Sea and the forests, where some of you have already been. The most familiar location to you is the tavern. Next to it are the training grounds and farther away is the city mayor's mansion. Many past contenders have traveled to this very town to register for the tournament of champions, and only sixteen of them have become true champions of those tournaments so far. 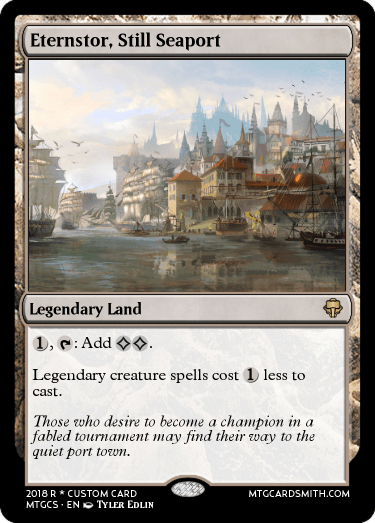 The town is rather quiet except during the times, whenever another tournament is about to be held. Most people live and work near the busy docks while the tavern is next to the town gates. Once the two weeks are over, the tournament judges will decide which contenders shall fight within the 17th tournament. This particular town is very important for the tournament hosts, but the reason is not known for sure by outsiders. When the contenders have been chosen, they will sail with the tournament staff to the world, which is the home of the tournaments. Since there has been recent unrest within the town, tavern and the forest (which is quite common during these times of the year), judge Gaspar has ordered more of his men around the town. Those soldiers have handled many chaotic contenders since the 1st tournament, and right now they seem to be interested in finding the lost guardsman. Dragons lie all of the time. The dragon and rider had experienced another brilliant victory, but would it last?. The crowd was getting tired of the same old fight over and over again. They challenged the rider to partake in the 2nd Tournament of Champions. The cowardly rider tried to refuse, but the dragon threatened to to desert the rider if he did not participate in the event, to abandon him and the rider knew that he was incompetent without the dragon. The rider agreed on the condition that it would be the dragon that entered, not the rider, to this the dragon readily agreed. I mean just think about all the treasure it would get when it won. Nya awoke in what seemed to be an infirmary, Tai was asleep next to her. She sat up and thought to herself. I told Tai the truth, people did take me as an outcast, a freak of nature, but they all had too accept it, for she was royalty. The daughter of Mat' Selesnya, created from the essence of the earth. People hated her, called her an abomination, but again, there was nothing they could do. She was also to become the next guild leader of Selesnya. She was in the midst of making a necklace out of vines when a bright light erupted in the room. The 2 people in white appeared. "M'lady, the people are happier than ever." "No doubt due to my absence." Said Nya with a solemn voice. The people in white stood there in silence. Nya looked down. "Leave." She said. They nodded their heads and vanished in a cloud of smoke. Konus whimpered. Nya looked at him in surprise. "Where have you been!" She said in a stern voice. Tai woke up, she was in the middle of nowhere or so she thought. She was on a plain blue bed with white covers. Beside her lay Nya, still asleep. The room was quiet and blank. Tai scanned the room for her pouch and rose. They were under her pillow. She snuck out of the hospital wing and headed to the battlefield only to be stopped by a Warrior. “I... I am...” Tai stuttered obviously not knowing what to say. He grabbed Tai by her hand and dragged her to the battlefield. Tai reached into her pouch and threw some red powder on the sand. Quickly, Sir Robin cast it away. It seemed to do nothing. Tai gasped and charged with her rose. Only moving his sword he parried Tai’s blow and she was knocked back. I have a lot to learn, Tai thought. Suddenly, Sir Robin vanished through pillars of sand. He jabbed at Tai from behind, struck by surprise, Tai fell over, seeming to dodge the sword. Robin was very fast.Tai channeled her lunar spell, the lance she made glowed as bright blue as ever. She threw it at Wardman. This inflicted damage though. It knocked him back as he slammed to the floor. Tai smiled. Wardman just laughed. He sped up, this time Tai shot some black powder from her rose at the ground, and instead of vanishing through the sand, he coughed in dark smoke. Robin’s eyes widened, not knowing what to say. My first stop for art is google. I usually use a different search engine but google seems the best for images. Next is DeviantArt.com. The various filters make it easy to find things that are near what you are looking for. Pinterest is good. I don’t find a lot there but sometimes it’s good because someone has already curated collections to look at. I also suggest Artstation.com which is like Deviantart but seems to have more professionals.